Get Started with Talent Swiper Personal! Open the app, tap the menu icon, then My Login, and enter the email and password you used when you signed up. Browse to the LinkedIn profile of a candidate. Tap the to bring up the extension. Login with your email and password. Then add a job and add yourself as a reviewer with the email you used when you logged in. Tap the + next to Profiles to add this LinkedIn profile. Wait till the progress bar stops, then roll your mouse over the new profile you added. Take a look at the information NimbleCat found. See a ? That's the NimbleCat evaluation for that candidate. No ? NimbleCat's AI had no opinion on that candidate. Try another. Add some more LinkedIn profiles then tap GO to start reviewing them in the Talent Swiper app. 3. Review the Profiles You Just Added! Restart the app. Once you've reviewed your first profile, you can opt to be notified by push message when there are other profiles to review. See the profiles you just added? Cool! Swipe right to like or left to not like the profile. Want to download your work? 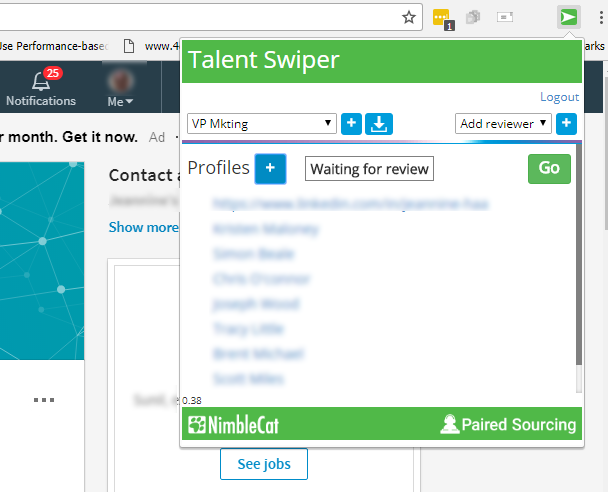 Tap the download icon and Talent Swiper will download a spreadsheet with all the links you added to Talent Swiper.